There was plenty of disappointment and at this year’s Pinot on the River held at Rodney Strong Vineyards in the Russian River Valley on Sunday, October 24. The region had been deluged with six inches of rain over the weekend and the organizers, Eric Hall and Gregory S. Walter did not have an alternative venue. It was held partially under a tent on a grassy knoll in ankle deep water and mud. I was fortunate to wear some weather boots but some of the women came unprepared and left early. 100 wineries were scheduled according to the program, but several did not show up because of the inclement weather. There was no dollies or assistance for wineries trying to move their wine in the rain from the parking lot to the tasting site which was some distance away. Consumer attendance was noticeably poor giving the impression that the bloom had come off the rose for Pinot Noir. For the $85 admission fee, there were no amenities such as signage to identify where the wineries were located (they were not in alphabetical order), spit buckets, spit cups, bottled water or a place to stash your umbrella. The few food offerings had to be purchased. The program consisted of a single sheet of paper with a list of wineries with nothing more than phone numbers and web addresses and no other information. There was hardly any blank space to record tasting notes. The bright spot at the event was the high quality of the Pinot Noirs offered and the cheerful attitude of the winemakers and winery assistants who weathered the storm so to speak to proudly pour their wines. One person, in particular, stood out for me. 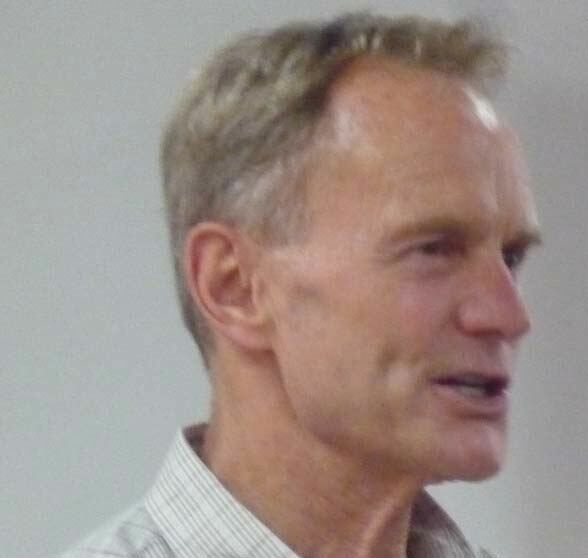 Here was Richard Sanford, an icon in the wine business, having traveled over 400 miles, smiling, speaking in his usual soft and pleasing manner, and enthusiastically pouring two of his outstanding 2008 Alma Rosa Pinot Noirs. Many wineries send tasting room assistants or other employees to pour at a lesser event like this. Not Richard. He is a tireless promoter of his wines and manages to appear at practically every Pinot Noir event in California. I have the utmost admiration for him because he is not one to rest on his laurels. In 2002, a number of events played out that eventually led Richard to loose his namesake Sanford Winery. 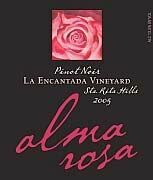 Undaunted, in 2005, Richard and his wife, Thekla, began a new venture, Alma Rosa Winery and Vineyards. Alma means “soul” in Spanish, reflecting the Sanfords’ view that their wines represent the soul of the Rancho Santa Rosa, the original Mexican land grant on which their vineyards are planted. When Richard left the Sanford Winery, the Sanford & Benedict Vineyard and the La Rinconada Vineyard and winery were relinquished in exchange for the El Jabali Ranch (the site of the Alma Rosa tasting room and Sanford’s personal home) and the La Encantada Vineyard. The Sanfords now organically farm over 100 acres of estate vineyards. There are several Pinot Noirs produced, along with Chardonnay, Pinot Blanc, Pinot Gris and Pinot Noir Vin Gris. The Alma Rosa tasting room is open daily from 11:00 AM to 4:30 PM at 7250 Santa Rosa Road in Buellton. The wines are also sold online at www.almarosawinery.com. There were a number of Pinot Noirs that really stood out for me at this event. My sampling was brief so I do not have extensive tasting notes. However, when wines grab your interest after a brief encounter, they are worth seeking out and spending some time with. Arista 2008 Longbow Russian River Valley Pinot Noir, 2008 Manoni Vineyard Russian River Valley Pinot Noir, and 2008 Toboni Vineyard Russian River Valley Pinot Noir (All are very solid wines and different - Toboni is exceptional). August West 2009 Rosella’s Vineyard Santa Lucia Highlands Pinot Noir and 2009 Graham Vineyard Russian River Valley Pinot Noir ( One of the few wineries pouring the 2009 vintage and these two wines were astonishingly good and surprisingly very approachable now. Winemaker Ed Kurtzman is really on his game in 2009). Benovia Winery 2008 Cohn Vineyard Sonoma County Pinot Noir (Planted in 1970, this vineyard outdates most other plantings in the Russian River Valley), and 2008 Le Pommeraie Russian River Valley Pinot Noir (From a Martinelli Family vineyard which was once an apple orchard along the Laguna Ridge - clones 777 and 828 - remarkably intense fruit flavors with bright acidity and certain to be one of my 2010 All Americans). Buena Vista Carneros Winery 2007 Ramal Vineyard Pinot Noir, 2007 Swan Clone Pinot Noir, and 2007 Dijon Clones Pinot Noir (All reviewed previously and still tasting great). Eric Kent 2009 Small Town Sonoma Coast Pinot Noir and 2009 Stiling Vineyard Russian River Valley Pinot Noir (Eric was pouring barrel samples and these were very impressive and rather precocious). Foursight Wines 2009 Estate Anderson Valley Pinot Noir (Several hundred cases of Pinot from 08 were made but severe spring frosts that year caused a 40% loss in crop for that vintage. The wines will be released in 2011. Several lots were not affected buy the wildfires that summer. The 2009 is an excellent followup to their very good 2007 vintage wines). Heart O’ The Mountain 2008 Estate Santa Cruz Mountains Pinot Noir (A great followup to the fine 2007 vintage estate Pinot Noir with more modest alcohol, more complexity). 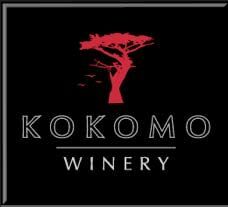 Kokomo 2008 Peters Vineyard Pommard Clone Sonoma Coast Pinot Noir (A beautiful wine crafted in a charming, restrained style but still sporting the earthy, dark fruits of the Pommard clone. Look for my review of this new producer in an upcoming issue). Littorai 2008 Mays Canyon Russian River Valley Pinot Noir, 2008 Platt Vineyard Sonoma Coast Pinot Noir, and 2008 Pivot Vineyard (Estate) Sonoma Coast Pinot Noir (All are exceptional wines with impeccable balance that we have come to expect from Ted Lemon and no signs of smoke taint. The Platt Vineyard bottling is crazy good now). Small Vines 2008 Russian River Valley Pinot Noir and 2008 MK Vineyard Sonoma Coast Pinot Noir (Both are bright, discreetly concentrated, with layers of fruit and interesting aromatic nuances. The MK Vineyard bottling is top shelf). Sojourn 2009 Ridgetop Vineyard Sonoma Coast Pinot Noir (I continue to be impressed with the Pinot Noir from Sojourn and this wine, not released yet, was one of the best I sampled at the event). Talisman 2007 Wild Cat Mountain Los Carneros Pinot Noir (Scott Rich crafts interesting, complex and exotic Pinot Noirs from challenging sites that will give those French something to talk about).